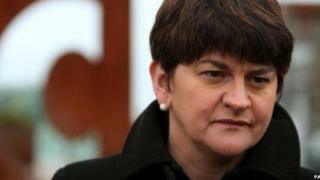 A man is to appear in court after Democratic Unionist Party leader Arlene Foster received abusive messages on social media. Police have charged the 18-year-old with the improper use of a public electronic communications' network. He is due to appear at Newry Magistrates' Court next month. It is understood the content sent to Mrs Foster, Northern Ireland's former first minister, was both violent and sexually explicit. A police spokesperson said: "As is normal procedure, all charges will be reviewed by the Public Prosecution Service."